Home / Cybercrime Law / facebook / fan page / JV Ejercito Estrada / KLOUT / netizen / Representative / san juan / Senatorial Candidate / twitter / UNA / Will KLOUT do Good on JV? Will KLOUT do Good on JV? Cybercrime Law is one of the hottest issues that topped the news in 2012. With one senator being blamed for the discrepancies of the said law, the country, particularly the freedom of speech in the worldwide web for the Filipinos remain a game of chess that needs a good game plan. And if KLOUT - a site that dedicate itself in digging deep into social media to understand how people influence each other, so that everyone can discover and be recognized for how they influence the world - could only tell to every Filipino netizen who could help them depend their freedom of expression, I believe, with his score of 73, UNA Senatorial Candidate and San Juan Representative JV Ejercito Estrada is the man who can backed us all up. A consistent top position in social media rankings, the young lawmaker believes that the Cybercrime Law contains provisions which practically permits the state to suppress freedom of speech and persecute its political foes. Gaining a top influencer position in the credible world-wide site, JV believes that netizens nowadays use social networking sites as a venue to rant against people, specifically politicians, who are always on the hot seat when it comes to criticism. But Ejercito Estrada believes that the government must not be given the power to regulate the online activity of Filipinos. As a netizen himself, who personally handles his social media accounts, with a little support from his staff, Ejercito Estrada shared that being an active netizen enables him to be up-to-date with the latest trends and other developments concerning people, most specially the young ones, giving him an opportunity to know his people well. "Many people doubt if I really do the posting on Facebook and Twitter. I do it myself because I like being hands-on. Also, after a day's hard work, it's therapeutic to share what you've done to the online community," said Ejercito Estrada. Despite of his busy schedule, which includes out of town trips and business meetings, San Juan Rep. JV Ejercito Estrada tells that he never fails to check and regularly update his social media accounts through his Blackberry, iPhone, and iPad Mini (techy, di ba? ), giving him the chance to score high on KLOUT. Being one of the most active netizen-politicans in the Philippines today, with 24,198 followers on Twitter, 5,135 friends on his personal account on Facebook, and 101,807 followers on his Facebook Fan Page, he find these media the most convenient way to get in touch with hi supporters, specially the Filipino youth in all parts of the world. And this year, as every politician in the land takes the challenge of the role of social media in their campaigns for the 2013 elections, Ejercito Estrada said he intends to share his legislative agenda to 30 million active Facebook users and 9.5 million active Twitter users in the Philippines. 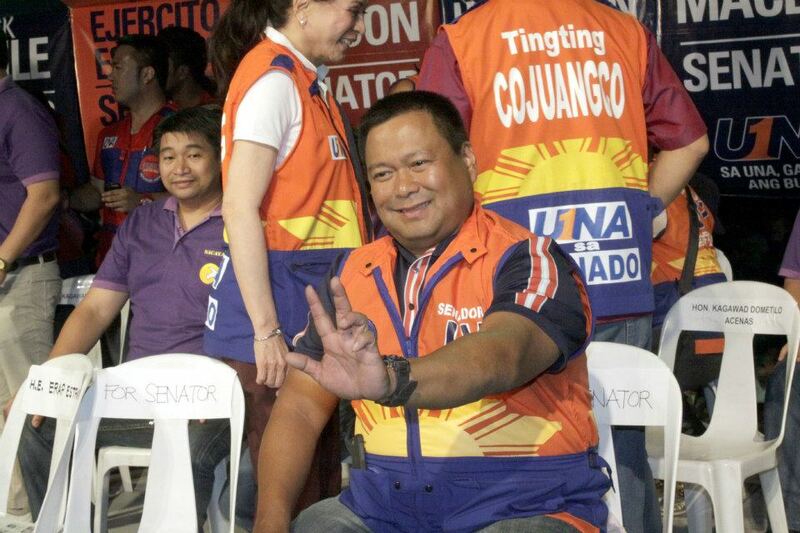 "Since I filed my certificate of candidacy, I have received a lot of input from the online community -encouraging words, offers of support, and even questions on my advocacy and my competency - all of which contribute to honing our campaign to be responsive to the needs and expectations of our electorate,”"concluded UNA Senatorial Candidate and San Juan Representative JV Ejercito Estrada.